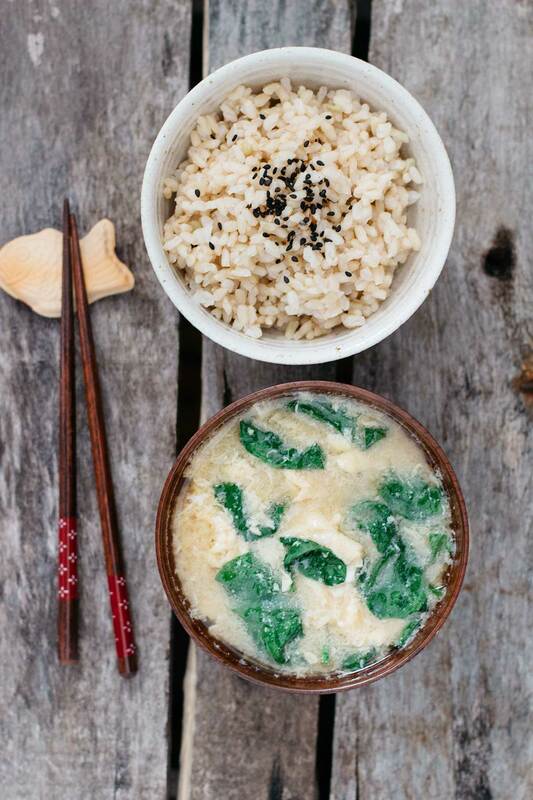 There are many variations of Japanese miso soup and so many different miso soup ingredients you can add to make delicious flavour combinations! 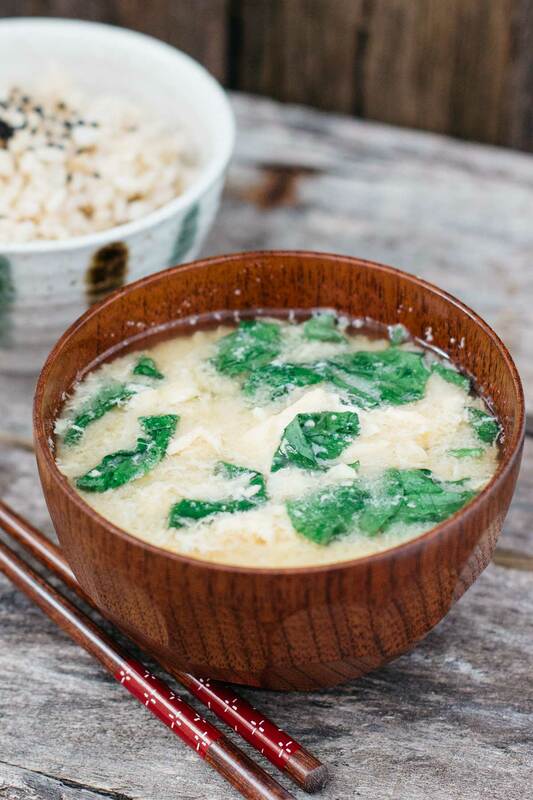 One of my favourites is egg and spinach because they go so well together in the miso soup, it’s healthy, and it tastes amazing. It’s also very easy and quick to cook and makes a healthy side dish to many meals and even as a main meal for breakfast! 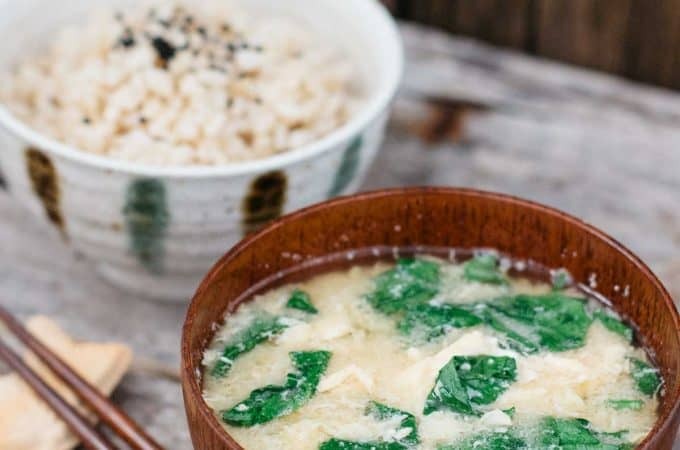 Usually when you buy Japanese miso soup packets or eat it at a restaurant, it is just filled with seaweed and maybe tofu, but there is so much more you can do with Japanese miso soup to make it a different soup every time. Egg and spinach are great ingredients to add because they’re healthy and can be bought anywhere so you don’t need to go to any specialty asian grocery stores to buy them. It’s also a great way to add some extra protein and veggies to your meal. You can also sprinkle some sesame seeds or spring onions on top to make it even better. 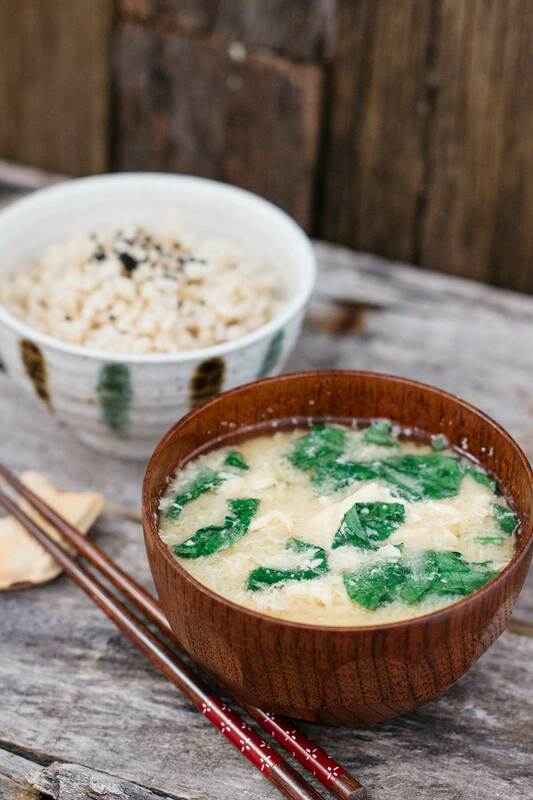 This delicious Japanese miso soup tastes great as a side dish for many meals, especially with some sort of fish and rice, like a traditional Japanese meal. 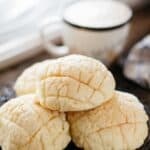 I even eat it for breakfast sometimes along with some rice or fruit because it’s a healthy breakfast option that fills me up. You can also put it in a soup travel container and eat it for lunch instead of buying a takeaway version because you never know what they put in it! Making the Japanese miso soup is always better because you can make it the way you like and add whatever ingredients you like! 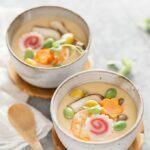 There are many other miso soup ingredients that you can add so stay tuned for future miso soup recipes and I hope you enjoy making this one! Add the miso paste and dissolve it into the dashi. Simmer for a few minutes until the eggs and spinach are just cooked(try not to over cook). I am drooling! I think how you mentioned perhaps having it as a side dish with fish and rice is great but I wonder how adding the fish and rice to the soup would go. I think it would be very nice too if done right. A one bowl meal of delicious healthy yumminess! Hi Sue, Thank you for your comment 😀 I am not sure adding fish to the soup but adding rice would go very well. If you add cooked rice to the miso soup, it is called “Ojiya”, which is one of those Japanese comfort food 😀 I actually ate this miso soup with rice in it. wow nice combination of flavors! Love your blog. I am learning so much. It seems that bonito stock is needed to make dashi but they appear to be interchangeable is that true? 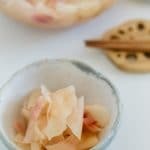 Hi Jennifer, you can make dashi from bonito flakes, Niboshi(dried baby fish), Konbu(kelp) and dried shiitake mushrooms. So yes, you can. If you would like to know more, please read here.